commented on "Well, it was a huge Anzac Weekend marking the centennial of the Gallipoli landings. The 1915 section of the Nelson ..."
Well, it was a huge Anzac Weekend marking the centennial of the Gallipoli landings. The 1915 section of the Nelson Provincial Museum's WWI: Their Stories, Our History, opened on Friday night, 24 April, following the playing by four buglers of The Last Post on all four corners of Trafalgar-Hardy Streets, outside the museum. It was spine tingling. The exhibition launch was fabulous and made all the more special by the attendance of the second secretary of the Embassy of the Republic of Turkey, Kutluhan Celik, and four Ghurka soldiers, here as part of a contingent of 50 spread around the country to attend Anzac Day services while in New Zealand on military exercise. I was the content curator for this exhibition (for last year's 1914 section I was co-content curator) and I thoroughly enjoyed all the research and writing of the exhibition panels and helping with the selection of all the images. It was quite a task, covering not only the Suez campaign but also Gallipoli and what was happening at home. There was some crossover with my Italian history and the community's WWI story is told in its own panel. This photograph shows me with Anna Wilkinson, who was in charge of selecting all the exhibition objects and images. 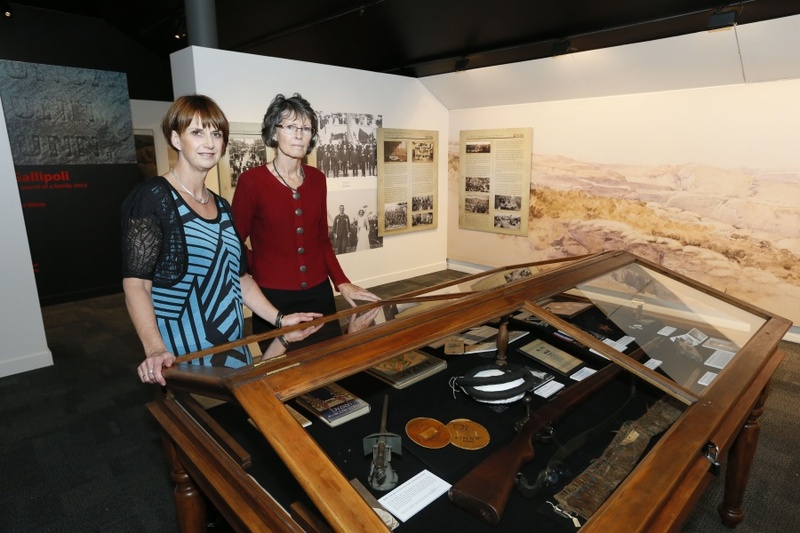 But there is also a big team behind us who did a lot of work to get the exhibition ready for the Anzac launch.